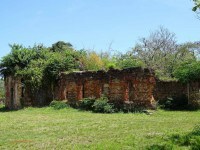 The ruins herein pictured are of the chapel known as Ermita de la Candelaria in what used to be the 600 acre Hacienda La Candelaria, most commonly known as Hacienda El Plantaje. El Plantaje was located between the mouth of the Bayamón River, the Palo Seco Point and La Plata River. The Ermita was built by Miguel Enriquez (1674-1742), some say ca. 1710 some by 1735, and was blessed as a place of worship in 1779. Miguel Enriquez was a free black corsair born in San Juan to a priest and a slave who during his time became a prominent citizen accumulating great wealth. Enriquez was the victim of racism and envy and was eventually jailed, El Plantaje was then passed on to its administrator Pedro Vicente de la Torre. 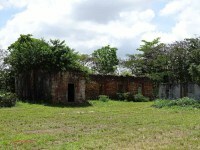 In 1839 the Ermita, then owned by Asunción Gonzales, served as the initial town church for the short lived town of La Trinidad de Palo Seco (1839-1845). 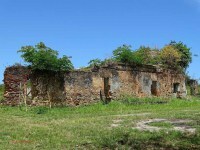 The hacienda had several changes in ownership due to inheritance, some of them being the Sucn. Medina ca. 1942, Marcelino Geigel and his estate and the Jiménez family who are reportedly its current owners. Other reported owners were Enrique Gould and during the 1840s David Quinlan, most likely David Gervacio Quinlan Martinez the son of David Quinlan a member of the Cavalry Militia who arrived in PR during the 1760s and nephew of Miguel (Jaime?) 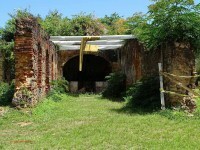 Quinlan who during the 1790s owned an ingenio in Loiza. 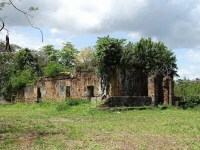 The ermita was a place of worship for the owners, friends, workers and slaves. In its immediacies it had a cemetery divided in three sections; one for the owners and family in the back of the chapel, one for white people on both sides of the chapel and another for black free people and slaves in front of the chapel.